The three, active in the Covenant Church, vine and fig tree planters and plowshares, were arrested in the midst of a Pentecost service at the military company SAAB Microwave, Sweden, on the 27th of May 2012. They were released after 45 min, 7.15-8 pm. The Holy Communion service took place at SAAB Microwaves (Mölndal, Sweden), a company that makes radar for military use. A Swedish vine was planted as part of the service. Three persons were taken into custody as they climbed the fence. The three were Pastor Leif Herngren, (Covenant Church Björkö), Claesgöran Johnson, (Rosa Huset Lövgärdets Covenant Church) and the usher for the Pentecost service, Per Herngren. 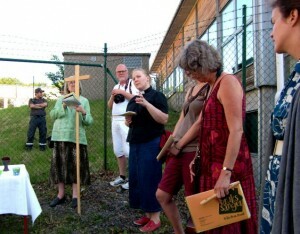 A priest in the Church of Sweden, Sara Blom, who preached during the service, was not arrested. Neither was Pastor Bengt Andréasson, who conducted the service. SAAB Microwave is the fifth largest supplier of military radar in the world and supplied fire-control systems used in the war in Iraq. During the service all kind of protest and negative messages were avoided, see Postprotest. ”We managed to plant one Scandinavian species of vine plant before we were arrested,” says Claesgöran Johnson. “And complete the communion and the church service,” adds Per Herngren. Soon an English text will be published there, too. After Pentecost the Church meets with resistance and protest. Stoning, imprisonment and executions follow directly on the change of direction outward, starting with Pentecost. Since the living Church claims life where people are being threatened and oppressed, the Church is always met with resistance. Pentecost, as the living of life, the life that doesn’t make excuses, will imply prosecution. The resistance begins with Pentecost.